Home > Blog > Articles > Tea party! 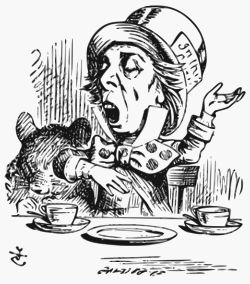 – not only the Mad Hatter enjoys one! Tea Party: (noun) a social gathering in the afternoon at which tea, cakes, and other light refreshments are served. The Tea Party is a staple of the British summertime and one of the many things that make this country so unique – our love of tea and our ability to throw a great party! Throw those things together with a sprinkle of jazz music and you’re onto a winner. John Montagu, fourth Earl of Sandwich (1718-1792), a British statesman, is said to have invented the sandwich so that he would not have to leave his gaming table to take supper. And we salute him for it! To make sure your party has the real tea party feel, make sure you lose the crusts and cut your bread into small triangles. After all, finger foods are the best kind of foods. In terms of fillings, keep it classic: think cucumber, egg and cress, thick-cut ham. Again, food related, this is just as much about the presentation as it is the taste. Make sure your sweet goods are displayed on a multi-tiered cake stand. People are going to help themselves so make sure you get plenty in – 3 sweet items per person is a good rule of thumb! Scones, fondants, cupcakes and muffins will all go down well. For an extra touch – why not try and keep the colours related to your theme? Icing and all! In an ideal world, we would all be sipping tea at the party on a country lawn while the kids play croquet. If that’s not an option because there is no country lawn or because the Great British weather is proving typical then make sure your event room is decorated in a classic style. I know, I know, the clue is in the title, but if you’re serving tea, it has to be done right. Whether you go with loose leaf or bagged, make sure you have the right equipment to suit all tastes. Have cream, sugar, and sliced lemons available on the table, and go with classic porcelain cups and teapots to give the day a real Victorian feel. On the topic of Victorian – why not try giving your party a theme, such as: Victorian, royalty, princess, or Alice in Wonderland. Dress the part and let your guests know on the invite so they can join in the fun. Now, as a band for hire in the UK we are always going to say that music is the most important aspect of your tea party (but it really is!). You want to create ambiance without overwhelming your guests. We love performing at tea parties because often we will perform acoustic soft jazz numbers as guests sit and enjoy tea before ramping it up a gear once they’re done with a few louder numbers complete with horn section to get people on their feet and dancing those cakes off! If you would like to discuss your upcoming tea party please do get in touch. With years of experience, even if we don’t perform at your party we can certainly make some recommendations. All of our details can be found on our contact page.